Plataea is an amazing historical themed online slot machine game, which relates on a wonderful storyline of the famous battle of Plataea between the Greek and the Persian armies in the time of 400 BC. Developed by WMS gaming, the game contains 5 reels and 50 paylines and allows the players to win via numerous free spin rounds and re-spin rounds as well. The game can be played both free and for real money, and is right now only available in casinos based in UK. Players playing with money are guaranteed a better payout and challenges. The game consists of 5 reels and 50 winning lines backed with 4 rows per reel. The game boasts bet structure of 25 coins + 15 side bet coin, which can be issued at maximum. RTP of the game is a whopping 95.08% and gives away a modest jackpot of 200 coins. The game symbols have a very high value and they include two warriors with one arm raised and ready to strike and a lady. These coins are worth for different valuations like on hitting 5 reels the payout is 150 coins, on hitting 4 reels the payout is 50 and finally 15 coins can be won on hitting 3 reels. The forthcoming level does contain 4 more unique selling symbols, which include a ship, a shield, a crossed sword, a helmet and a sword with sheath. The valuations of these symbols are 150 for 5 and 40 for 4. The lowest pay symbols in the game are goblet, pillar and coins. Their total valuation is nothing more than 100 coins for 5 reels. These wins ensure that the players can also score multiple wins in one single spin, which is the USP of the game. The symbols appear arranged on the reels will help the players to connect 5 of the same symbols to score a big win. The game possesses Wild Symbol, which comes to play an important role. The symbol used in Wild is the close up of a person with Golden Helmet who is staring out of the game screen towards the players. Wilds do appear stacked on the reels and has the capability to substitute any other symbols with an exception of the Acropolis symbol, which happens to be the feature symbol. Hot Respin Feature: In the main game, re-spins can possibly occur anytime of any round or even in the free spins rounds. The feature is activated on hitting stacked symbols, which takes all the position of the initial reel. A flame character appears having completely filled eyes and bob around the top of the reel. The re-spin feature also allows collection and gives any symbol, which is as same as the stacked symbols, a flame border. This is a special sign given in the game when it comes to dealing with re spin features. The feature assumes the players to get one more wild or the stacked symbol, which will allow the reels to spin for one more time, and thus the players get an extra bite at the cake for absolutely no extra costs. 10 Free Spin Bonus: On hitting the feature symbol i.e. Acropolis thrice in the same reel, activates minimum 10 free spins. A pop up will request to tap and activate the same. Thus, the free spin features does a lot in ensuring winning jackpot. 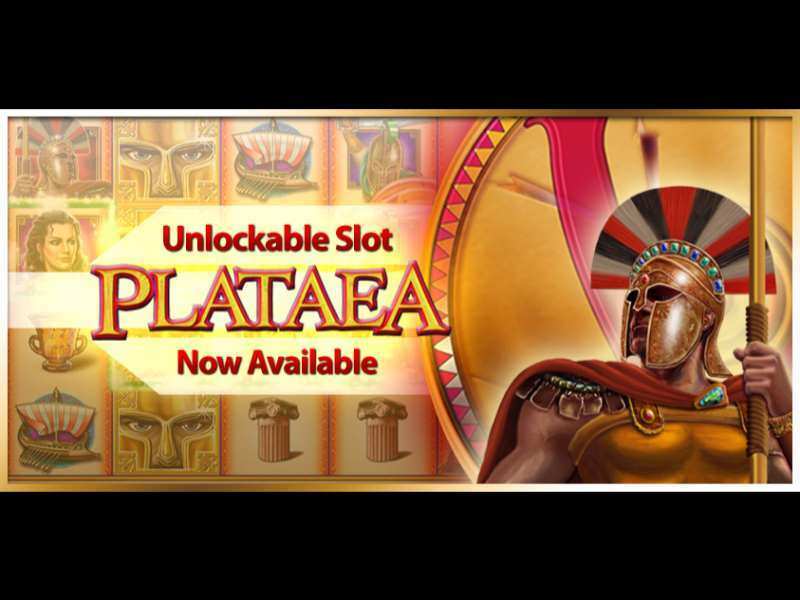 Plataea Online is a brilliant online slot machine game designed by WMS gaming, provides the player a virtual trip to the ancient land of Greece and the Middle East. The game is essentially based on the battle of Greek versus the Persian armies, which is popularly known as the Battle of Plataea around the time of 400 BC. The game provides slots and symbols, which can be closely associated to Roman empires like swords, armors and coins and these will be provided on winning a round in the original gameplay. The game boasts free spin features, Wild features and a feature symbol, which can be used to earn as much bonus, beyond one could imagine. There are certain rounds where the players stand a chance to earn multiple spins for one go, meaning to earn an extra round without having to pay any coins. The game can be played online in various online casinos, which support the games of WMS and it requires no download or registration to play in any of these casinos. A person can play free Plataea casino online slot machine and win free spins and modest bonuses as well. 0 responses to "Plataea Slot"